Thanks to all the folks at the Senate hearing last night who testified with such passion, intelligence, and empathy on all the gun safety bills. I'm glad to have been able to contribute a few words. Thank you Madam Chair, members of the committee. 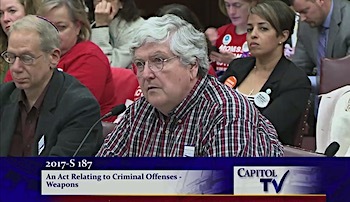 I’m John McDaid from Portsmouth, urging the Committee to support S0187 as a parent and a member of the RI Coalition Against Gun Violence, an organization representing more than 90 groups and 120,000 Rhode Islanders. That number is significant. Concealed weapons present a constant unavoidable risk. According to the CDC, in 2013 there were 16,864 reported unintentional gunshot injuries. That’s 46 firearm accidents every day. Arguments that permit holders would protect students and staff are deeply suspect. Applicants in Rhode Island only need to put 30 rounds in a 14-inch target at 25 yards every four years. There is no requirement for training in real-world tactical scenarios — or even drawing from concealment — nothing that would prepare them for the complex, high-stress situation of an active shooter. As the “school committee” for the state, the General Assembly as a whole has a duty to consider this bill. I may not know much about how things work at the State House, but back home in Portsmouth, if a group of concerned citizens representing 10 percent of the town asked to have something put on the agenda for the whole Council to consider, it would get a vote. I ask that this committee do the same. Thank you.